From left: branch clothing rack idea from Love Aesthetics; branch clothing rack from Apartment Therapy. Long ago, I posted on D.I.Y. decorating ideas that use tree branches. 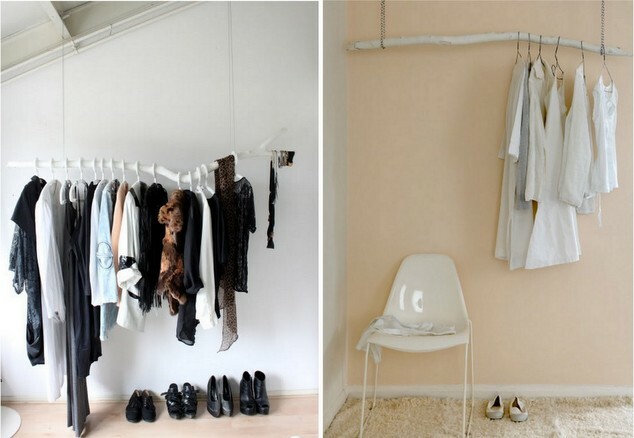 Here’s one more idea: suspend a painted branch from the ceiling for use as a clothing rack. I’ve seen three versions so far, two of which are above. Here’s the link to the third, which has the most detailed tutorial I’ve seen, and here’s a variation on the idea: a tree branch curtain rod. It’s a simple and inexpensive project, with striking results. Cool, right? The campaign originally ran in Romania as a low-budget way to promote Guinness during Halloween. It was a success. I decided to copy the ghost coaster (without fingers, as the material I used, cork roll, isn’t suited for detailed cuts), and then design one or two coasters of my own. Not everyone wants spooky, Halloween-specific decorations. People who consider Halloween a one-day holiday and people with conflicting religious beliefs may prefer more neutral seasonal options. The following decoration ideas are dual purpose: suitable for Halloween without being restricted to it. They’re also not scary, a bonus for households with small children and easily unnerved adults (ghastlier options will follow, of course). Note: Almost of all of these are D.I.Y., and if you click on the link you’ll get a recipe or tutorial. Golden harvest decorations from Country Living, gilded with Caromal Colours (photos by Joseph De Leo). Autumn Harvest ornament wreath (sold, similar items available) by Dottie Gray. Golden address pumpkins from Twig & Thistle. Golden pumpkins also from Country Living, gilded with Caromal Colours (via Dress Design Decor). Clockwise from top left: photo by Douglas Friedman, for Domino; pipe bookshelves via Lark & Linen; French industrial shelves, $799 from Wisteria (no longer for sale); bookshelf stairs from Locati Architects & Interiors; industrial closet shelving by D.I.Y. Diva (includes tutorial); sconce bookshelves, 2 for $139.00 from DirtyBils. 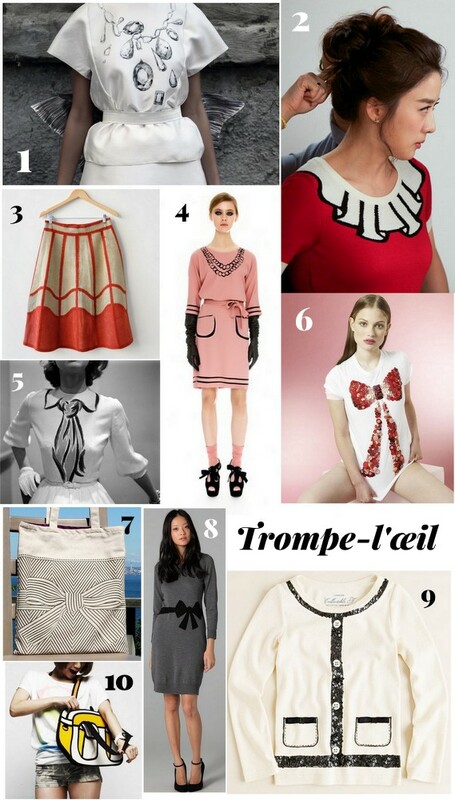 All images via Pinterest (click through for specific credits). Lately, I’ve come across striking examples of industrial shelving. Something about dark metal piping and rich-colored woods hits me square in the gut, and luckily, it’s a look that can be recreated without too much money or effort. See the links above for great retail options and D.I.Y. inspiration/advice. Not pictured, but also helpful, are these D.I.Y. 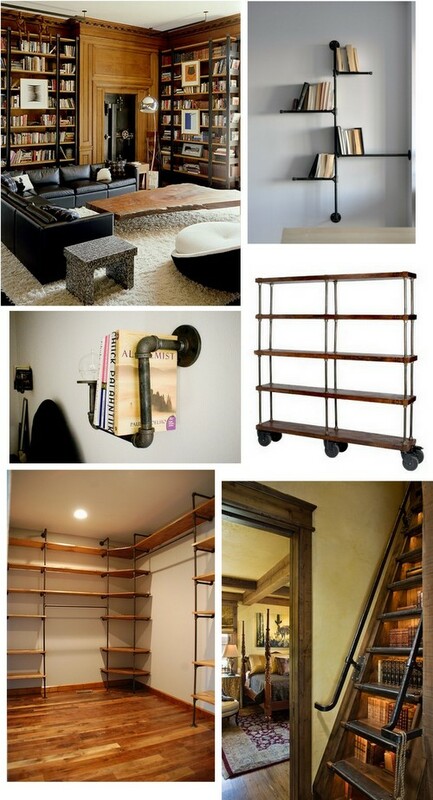 industrial shelving instructions from iVillage. P.S. There’s less than a week left to enter the Mad Men: The Illustrated World giveaway. The contest closes at 12:00 AM September 28th, and the winner & October’s giveaway book will be announced later that day. Thanks to all who have entered so far!